← Mt. Davidson Park – An Open Space Preserved for Recreation or Native Plants? 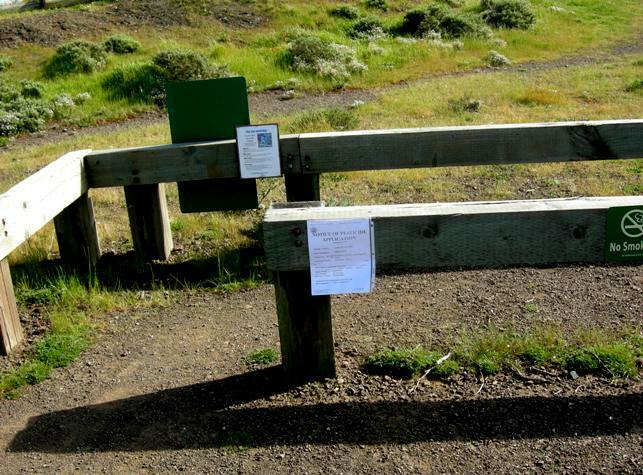 How Unnatural can San Francisco’s “Natural” Areas get? 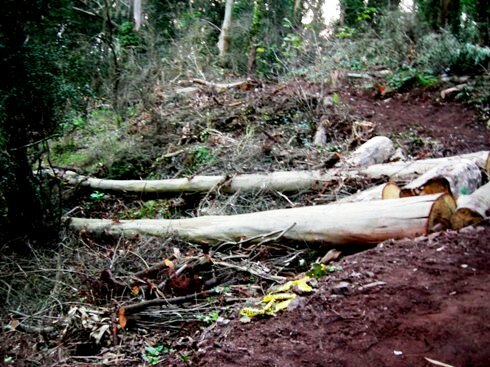 This post is republished with some modifications and permission from Save Sutro Forest. WHEN I first heard about San Francisco’s Natural Areas Program (SF NAP) some years ago, I was charmed. Over 1000 acres of city-owned land would be left to Nature, more wild and free than the orderly, gardened lawns and playgrounds (which I also appreciated, in a different way). Kudos to the San Francisco Recreation and Parks Department (SFRPD) — which owns the SF NAP — was my reaction. These would be spaces, I thought, where plants and animals and people could interact naturally. 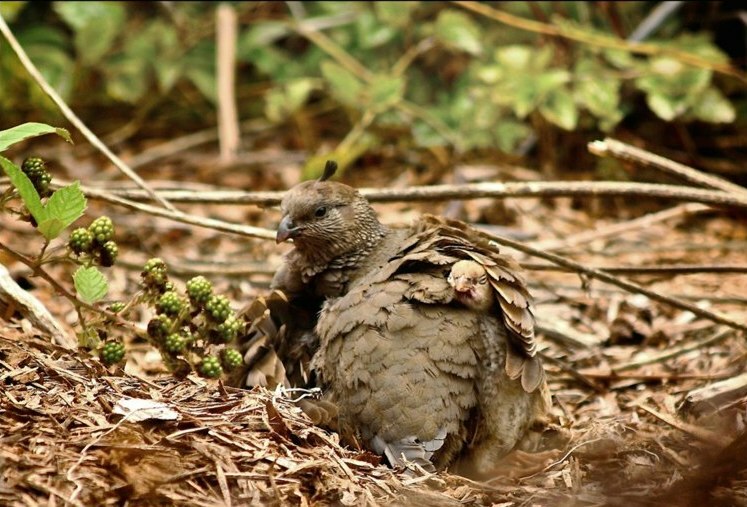 Birds and animals could safely breed in tangled thickets; so could bees and butterflies and other insects. They’d provide enough cover for birds and animals to hide from dogs, cats, hawks, coyotes, raccoons — and people. These spaces would be free of the toxic chemicals used in managing parks. Dogs could be allowed to romp through areas wild enough to tolerate disturbance. The only intervention, I assumed, would be to maintain some degree of safety on trails that animals and people would blaze through these areas. If like me, you thought that Natural Areas were going to be, well, natural… then like me, you were mistaken. San Francisco’s “Natural Areas” program is really about is Native Plants, most of which no longer grow in these places naturally. These plants grew (or may have grown) in these 46.9 square miles some 300 years ago. Some are still there. Others, even though common elsewhere, aren’t found in the city any more. Instead, other plants grow there, adding to the biodiversity of the area. According to Peter Kareiva of the Nature Conservancy, there are 25% more species in California than there were before “non-native” plants got here. What we’re actually getting, then, is Native Plant Gardens, 32 of them. Trying to push these spaces back in time means they must be managed and maintained, because San Francisco now is a different place and a different ecology from the windblown hills and sand-dunes of its pre-colonial past. What does this management and maintenance imply? Some — including Native Plant doyen Jake Sigg — have argued that one or two applications in a decade are all that’s needed, and are thus justified. That hasn’t been our experience. Two nearby Native Areas — Twin Peaks and Glen Canyon — have been sprayed many times annually for many years. According to their communications with some concerned neighbors, the SF NAP does not expect to stop. Some years ago, Save Sutro Forest ran an article on museum-ification. This is the fate of many of these “natural” areas: they come with more, not fewer, restrictions than gardens and parks. Many of the paths animals and people made naturally, called “social trails” are blocked. (They current plan closes or relocates over 9 miles of trails.) There are formal trails, and people must stay on them. They are discouraged from actually interacting with these environments, except as gardening or trail-building volunteers. Trees are being chopped down. San Francisco had some wonderful eucalyptus forests, many of them over a century old with a complex habitat and dense understory. Most of these are already gone. In addition, the plan calls for removing blackberry thickets, one of the richest and safest habitats for birds and animals. It calls for removing fennel, another tall and dense habitat plant which, just incidentally, is the nursery plant for the native Anise Swallowtail butterfly. It calls for removing vines from the trees, all of which provide some of the complex habitat small birds need. In fact, it seems to call for removing anything that grows lush and dense and useful to birds and animals. The result wouldn’t be a forest (urban or otherwise); it would be a garden with some trees in it. We are for preservation of existing habitats and ecosystems. We think places like the coastal scrub area on the slope above Laguna Honda Reservoir, (which has not been invaded by the contiguous eucalyptus forest!) deserve protection. This area is, incidentally, owned by the SF Water Department, not the SF Recreation and Parks Department. It’s visible from the road, but is not publicly accessible. We’re fine with planting scrappy semi-industrialized areas like Heron’s Head Park into Native Plant gardens; that area had a recent win when Clapper Rails nested there and successfully produced chicks. We object to converting parks devoted to other uses into such Native Gardens by imposing numerous restrictions. We object to habitat destruction; birds, insects and animals all use these “non-native’ habitats. 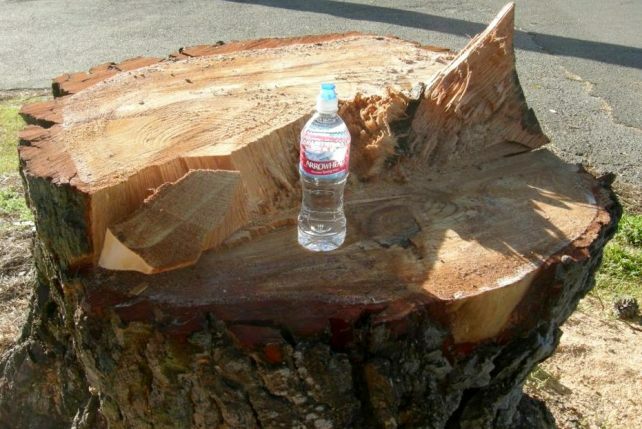 We object to felling thousands of trees. 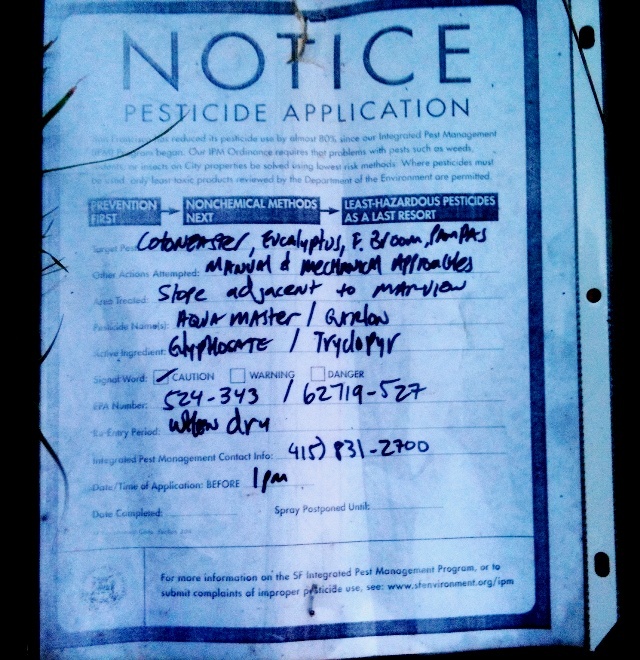 Most of all, we object to the use of toxic pesticides in areas that should, naturally, be free of chemicals. 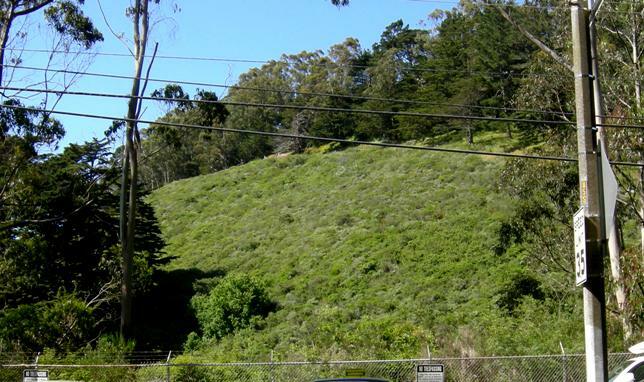 One Response to How Unnatural can San Francisco’s “Natural” Areas get?